I periodically freak out when reviewing emails that I’ve sent, particularly to printers, using Gmail’s (hosted apps) webmail interface. 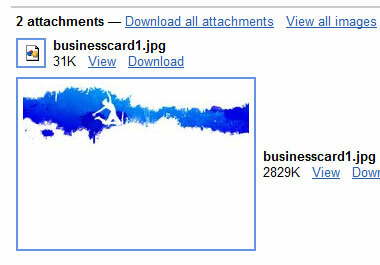 It has this habit of converting CMYK JPGs to RGB thumbnails really badly – but without apparent corruption. The blue in the image above is actually a deep red! Accordingly, while the colours are totally out of whack, there are no other artifacts in the image. Normally this just looks weird – sometimes, in the case of logo variants, it looks plausible but utterly incorrect! My guess is they’re using an older version of PIL (we all know how much Google loves Python) prior to this March 2009 patch. Sounds like the same phenomenon. Still, those people emailing CMYK JPGs has to be a little bit niche, so I’m not heaps hopeful of this getting fixed too soon! The main reason I care is because web interfaces are so much faster than retrieving large attachments from IMAP stores.